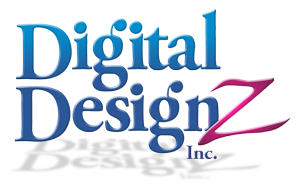 Digital DesignZ was established in 1997. We have been a full service graphic design company, incorporating in 2004. In our tenure we have worked with many different industries; pharmaceutical, industrial, retail, business services, educational and religious institutions. Our services range from concept, production, print, websites and hosting. Variable data within photos and photo retouching, are just a few other services we provide. Give us a call, we are local to the Gainesville/Manassas Virginia area.